Digital Costume Design and Collaboration gives in-depth instruction on how to draw, render, and fully design costumes using online tools and software. Grounded in the use of Photoshop, the book explains the process of building a costume design from scratch, including information on digital tools and painting techniques. The book demonstrates how to utilize social media, such as Flickr and Pinterest, to compile research; how to create user-friendly web based slide shows; and how to archive digital files for portfolios and personal websites. It also demonstrates how to organize spec sheets, plots and inventories using Google Docs for easy editing and Dropbox for easy file sharing. A companion YouTube channel featuring video tutorials of exercises and applications compliments the book. The "W" Questions or the "Nuts and Bolts"
Establishing The Character’s "Spine": Underlying Motivations, Back-Story, Secrets, etc. Sharing Files With Wardrobe Department: Google Docs, Dropbox, Etc. How To Make A 300 To 600 Dpi File? Design Gallery: Doll’s House, New Repertory Theatre, 2011. Design Gallery: The Seafarer, SpeakEasy Theatre Company, 2008. 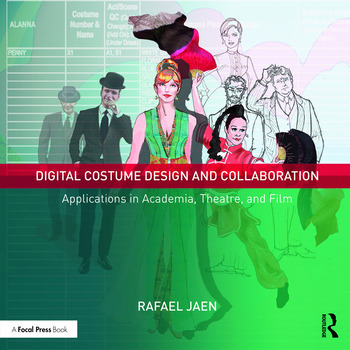 Rafael Jaen is a practicing costume designer, professor and author. Jaen’s costume design (and manufacturing) work includes film, TV and theater and he has received multiple accolades and award nominations including the prestigious Elliot Norton Award and the IRNE Award. He has been a member of the United States Institute for Theatre Technology (USITT), the United Scenic Artist (USA) 829, and the National Association of Photoshop Professionals (NAPP). He currently serves at the USITT Board of Directors and on the Publications Committee. Jaen is the National Design, Technology and Management Vice-Chair for the Kennedy Center American College Theater Festival (KCACTF), and he serves as the USITT-KCACTF Communications Liaison. Mr. Jaen is an Assistant Professor of Costume Design at UMASS Boston, MA.